This cake is a miracle, and I will tell you why. We had grand plans of making a raspberry mousse filling but ended up with chocolate sour cream frosting. This was unintentional. See, the whipped cream was stabilized with gelatin, which never thickened properly. We went along with the directions, however, but after only a minute or two of beating, the cream started to separate into butter! This was quite annoying since you would think it’s impossible to overbeat cream after only a couple minutes of beating! Nevertheless, we improvised and one thing led to another until we had chocolate sour cream frosting made with accidental homemade butter. It was quite the production! We’ll spare you any more of the details, but suffice to say it was one of the more interesting experiences in our kitchen so far. This cake recipe is for our favorite white cake. It has a hint of almond extract and has the perfect texture. It holds its own but is not dense or dry. The buttercream involves cooking together flour and milk, believe it or not, but it results in very, very fluffy frosting. 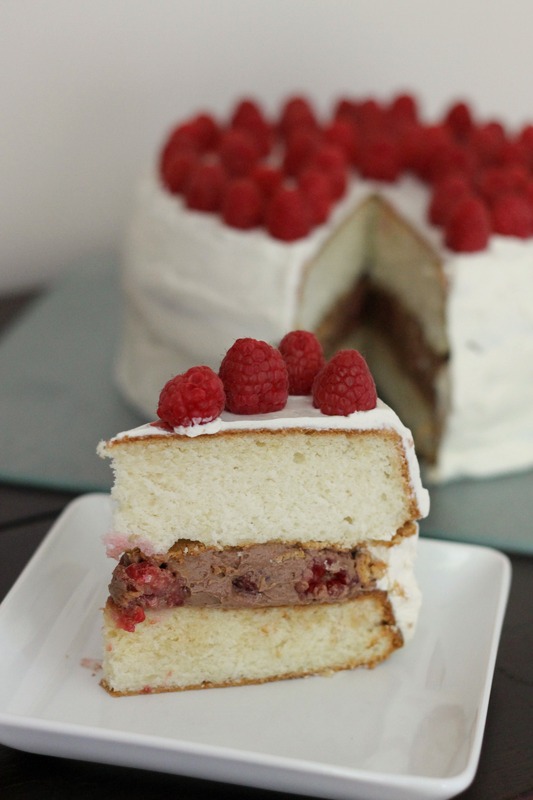 There are about 4 containers of raspberries in and on this cake, and it is quite delicious. We made this for our parents’ anniversary, and they enjoyed it as much as the cake at their wedding (which had a raspberry filling)! And yes, we all loved the accidental filling! Preheat oven to 350 degrees. Grease and flour 3-inch or 2 9-inch round cake pans. Combine flour, baking soda, and salt in a medium bowl and set aside. Beat together butter with 1 1/3 cups of the granulated sugar in a large bowl until light and fluffy. Beat in vanilla and almond extract. Add flour mixture alternately with buttermilk, beating well after each addition. In the bowl of a stand mixer fitted with the whisk attachment, beat egg whites at medium speed until foamy. Add cream of tarter and beat at high speed until soft peaks form. Gradually beat in the remaining 2/3 cup granulated sugar and beat until stifff peaks form. Fold beaten egg whites into flour mixture. Divide batter evenly into prepared pans. Bake for 30 to 35 minutes of until toothpick inserted in the center comes out clean. Cool cakes in pans on a wire rack for 10 minutes; loosen edges and remove to racks to fully cool. To make the vanilla buttercream, combine the flour and milk in a medium saucepan. Stir over low heat until thickened. Cool fully. Beat butter in a large bowl until creamy. Add powdered sugar and beat for 2 minutes until fluffy. Blend in vanilla. Add flour mixture and beat until fluffy and smooth. To make the chocolate buttercream, melt the chocolate in a heat-proof bowl set over a pot of simmering water. Set aside to cool until only slightly warm. In the bowl of a stand mixer fitted with the paddle attachment, beat the cream cheese and butter on medium-high speed until pale and fluffy, about 3-4 minutes. Gradually mix in the powdered sugar, cocoa powder and salt. Beat in the melted and cooled chocolate and then the sour cream. Continue beating until the mixture is smooth and fully combined. Level the cakes if necessary. On a surface, place the first cake layer. Spread well with chocolate frosting and top with raspberries. Place on the next layer of cake. If you are making a 3-layer cake, repeat these steps. Frost the cake with the vanilla buttercream. Top with raspberries. Serve as desired. Enjoy! Note: Keep this cake in the fridge if you are not serving it for several hours. It will be good for 2 days. We really like it cold out of the fridge, but it’s also delicious at room temperature. Also, take not that while this recipe calls for 4 6-ounce containers of fresh raspberries, you’ll probably only need about 3. 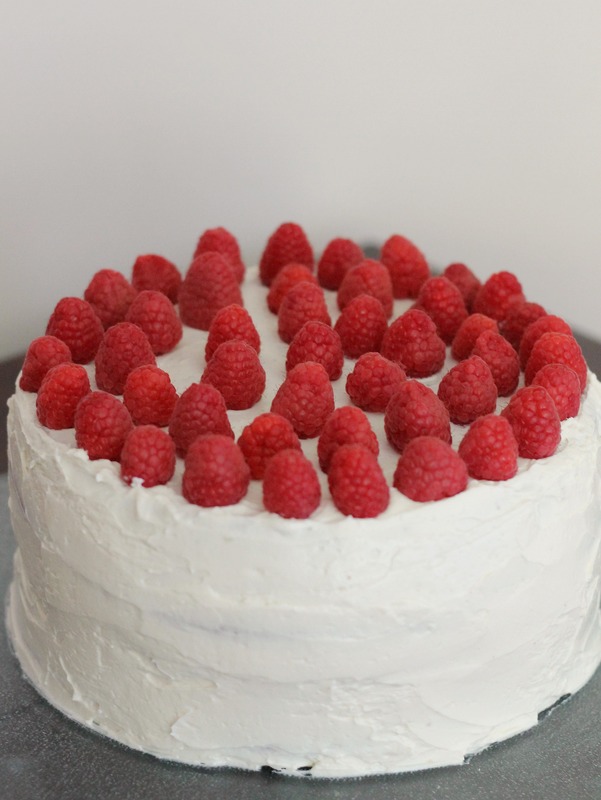 We accounted for bruised or broken raspberries that we did not want to put on the cake. Looks delicious! I loved that you improvised and it turned out great.